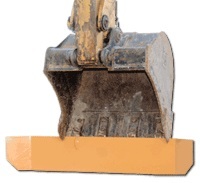 Hall’s Gradeblades: Patented, clever grading tools which mount to your backhoe or excavator bucket in minutes. Grade and smooth with without shovels and rakes. Slip the blade over your bucket teeth and chain bind (provided) it to a weld-on tab on the back of your bucket. Available in Squeege Blades with wings for surface grading, or as Crumbing Blades… in the same width as your bucket for either top grading or smoothing the bottom of a trench. Buy from Equipmentland for even less than buying direct. Throw away those rakes and shovels and slide on a Squeegee Blade. This blade reduces back-fill time and leaves a cleaner job site. 30 degree wings on each side keep the materials coming to you. Models to easily slide over any size teeth on any brand of machinery. Just hook up the chain and pull the provided binder. You’ll never leave teeth marks in your client’s yard or cut sod from using the side of your bucket. Squeegee Blade is available in six sizes, fits any size bucket from eight inches to three feet. Do the work of two buckets with just one. When you need a ditch for laying water mains, or footings for concrete, a smooth-bottom surface is necessary. Typically you would need to hand crumb the bottom of a ditch, but the Gradeblade Crumbing Blade is all that’s needed to obtain a clean, smooth surface. 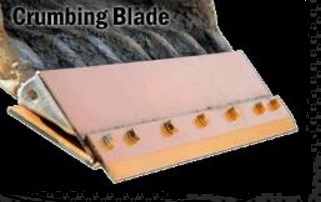 Designed for all toothed buckets, the Crumbing Blade installs in just 60 seconds and requires no tools. Just hook up the chain and pull the binder. All Crumbing Blades come welded on T-120 steel cutting edge. With NO wings, the Crumbing Blade is perfect for digging those smooth-bottom ditches, you can do the work of two buckets with just one. – Grade top surfaces after digging or crumb the bottom of a trench. – Quick and easy. No shovels or rakes needed. – See Detail Page for Models and Pricing.